Despite this, many companies haven’t made any significant change in the gender composition of their leadership teams. It would be silly to say companies are deliberately discriminating against women. I think for many, the intention to change is there, but they just don’t know how to go about it. This is particularly so for the companies who have a long way to go to achieve gender equity. It’s obvious they must start somewhere, so here are three ways companies can advance women into their top leadership roles. Setting a target to have 50% women in leadership levels by a set date can be too challenging to deal with, especially if the company is starting from a low point. If the target of 50% looks daunting, companies can break it down into smaller steps. The Commonwealth Bank broke the target down into stages so that it was more manageable. Not only do the smaller targets seem easier to tackle, but they also give a way to measure the progress of change. Whether you call it workplace culture or unconscious bias, the ‘way we do things ‘round here’ is often where women are disadvantaged. Practices are embedded so deeply into the culture that they are simply accepted. For example, early morning or post-work meetings are difficult for many women (and men) to attend, yet the conversations will go ahead, and decisions will be made, regardless. Not only is the quality of the resulting decision lowered by the lack of diverse and relevant input, but those who aren’t present also don’t have the opportunity to show their leadership abilities. What talent is lying undiscovered within the company? It’s time to question the status quo and improve the culture. All it needs is someone to highlight the situations and habits no one has noticed before, so they can be changed. It’s time for a new culture and companies might be surprised at how willingly it is embraced. Sponsorship is powerful. It’s personal, and the success of the person being sponsored is the success of the sponsor, too. When a male senior executive sponsors a female leader, he is personally investing in her success. He does more than mentor; he ensures she’s noticed and given opportunities as they arise – opportunities she’d probably have been overlooked for earlier. When she grows and climbs the leadership ranks, it reflects well on the sponsor, too. A lot of the commentary we see about men in leadership being threatened by women is rubbish. While there are exceptions, our current male leaders are aware of the need for gender equality and fully support it. These men aren’t stuck in the “old boys club” mentality. They have wives, sisters or daughters who are fighting the gender equality fight, so they know what it’s about. If they see a way to help, they’ll take it. Creating a sponsorship process gives them a tool to use so they can become part of the change. And when there is balance in the leadership roles, companies will have experienced sponsors of both genders ready to find and assist emerging leaders of both sexes in the future. Change must come from the top, and it must be seen to happen. Talking about change or planning for it is a start, but companies need to ensure their CEOs and executives are the first ones to get the ball rolling. Lead by example. If you need more help or ideas, speak to Caroline Kennedy, an experienced CEO in the public and private sectors. She’ll guide your company into a gender-balanced future. 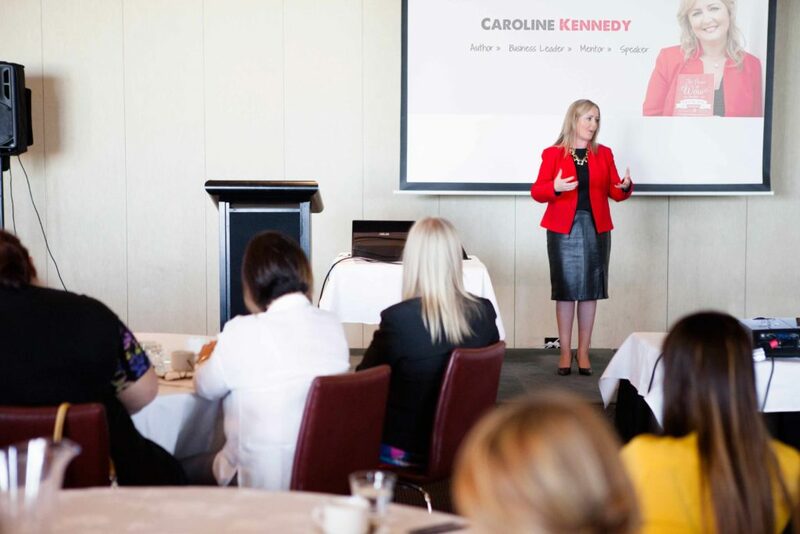 Caroline is the founder of Empowering Ambitious Women, an online hub which operates on the foundations of educate, execute, achieve - through shared experience, advice and mentoring. The best learning and empowerment comes from the ambitious leaders who have led the way and walked the path before us. As a member, you gain access to insights from intelligent, commercially savvy leaders who have walked the path before you, and you understand the importance of shared knowledge and wisdom to impact change. You are hungry for learning to become a master at what you do, and you are willing to be courageous, to challenge the status quo, and you know the value of surrounding yourself with the best. Our vision is to see over 1 million ambitious women in our community by 2022, and our mission is to give every ambitious woman the opportunity to step up and become a leader, creating a legacy to be proud of and to make their mark on the world. Contact us on 1300 88 53 94 or via email at [email protected] to discuss corporate membership for your team, or corporate mentoring.